As a student, its really important to have business cards. 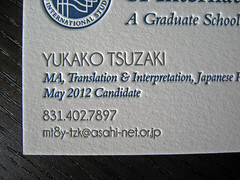 Why is it important for student’s to have business cards? Well just like everyone else, networking is really important to landing the job of your dreams. As a student I met a lot of great contacts but without a business card how are those people supposed to remember you? 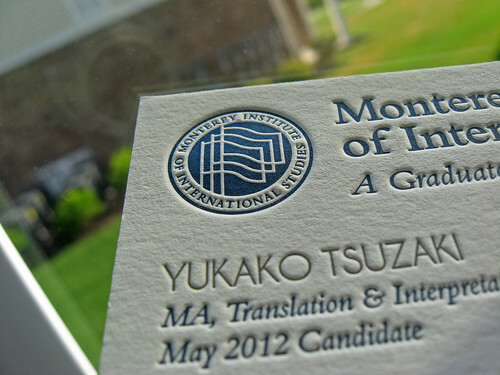 Any business card will do, but for people who want to make their cards stand out letterpress is a great choice. 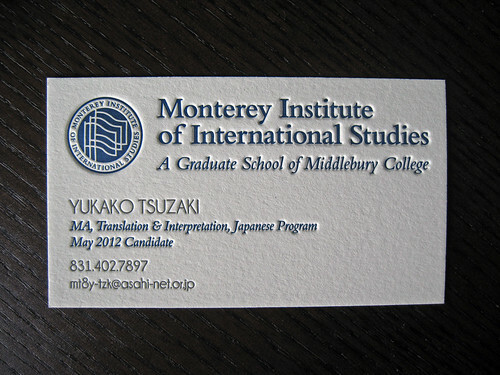 We printed these business cards recently for Yukako Tsuzaki, a student at the Monterey Institute of International Studies (MIIS). 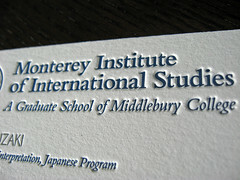 The cards were letterpress printed on Crane’s Lettra 110lb stock in two colors (Blue / Gray). We really like the MIIS emblem which was printed as a knockout. This kind of design makes the outlines of the flags pop out when printed (a faux emboss), really neat to see and feel on the business card! 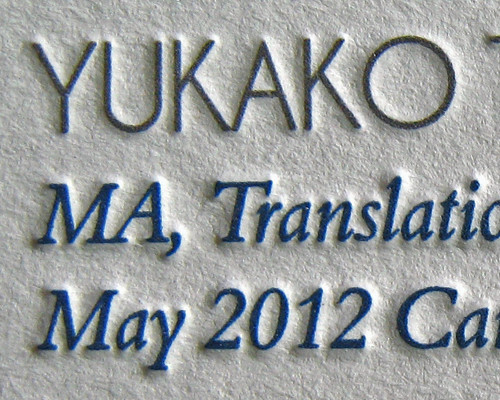 Here is a nice closeup photo of the blue and gray text to show the detail that can be captured in the plate and actually printed. We printed these business cards on a Heidelberg Windmill 10×15, and anyone who has used one can attest to the quality of printing it can achieve. That plus its speed makes it any printer’s best friend (pictured below)! Yukako gave us the concept for the layout and the graphics for the MIIS logo and we whipped up the final look. This happens with a lot of people, they know what they want but don’t have the time or experience to create the layout. Part of what we do is to work with these client to execute their vision and bring their ideas to paper.